How can biometric identification help judicial systems? Lee Burgess, 41, was charged with conspiracy to supply drugs earlier in 2014 in Liverpool Crown Court, UK. After the first trial in June jurors could not decide his guilt due to lack of evidence. Later in November 2014 after a second trial he was convicted when his fingerprints were found on wraps of cocaine bought by a policeman posing as a drug addict. We know following most crimes law enforcement agencies normally collect biometric evidence like fingerprints from the crime scene. This biometric evidence goes through rigorous forensic tests to identify the person related to the crime and store that information to an online database. This biometric evidence is later submitted to the judicial authorities during trial. Now just imagine if there is a biometric identification system present in the courtroom, it becomes only a matter of a single biometric scan to relate a suspect to a crime. Marcelo Marquez, a Utah man who was charged with killing two sheriff’s deputies and wounding two other people in a bloody chase through Northern California was arrested in 2014. After his arrest the local authority ran a biometric based background check and it appeared that he was twice deported by the immigration authorities in 1997 and 2001 from the United States, but he has since been living quietly for a decade. As mentioned earlier, law enforcement agency forensic departments normally store all biometric crime scene information in a centralised database. This database contains the biometric templates of people who have a proven or suspected criminal background. If a judicial system is also connected to this system, every accused person can be easily checked for a criminal history. One of the biggest news stories of 1998 was the trial of Bill Clinton, the US president who was accused of having inappropriate relationship with Monica Lewinsky. When Clinton was asked for a blood sample for DNA testing, he confessed and acknowledged “inappropriate intimate contact” with Lewinsky. Having DNA biometric testing capability can help the judicial system to solve disputes that involves proving a biological relationship. The accused, who often give different names at the time of arrest can be easily identified. People who stand sureties for the accused by assuming false identities can be identified. Stock witnesses who are in the habit of giving evidence in cases can be pin-pointed. No wrong person can be released from prison due to identity confusion. Identification of individuals from video and audio surveillance with facial recognition. How can biometric identification technology be implemented? Biometric hardware and software need to be installed on court computers. 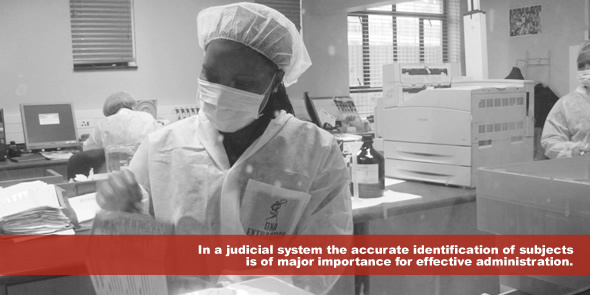 Biometric profiles of the accused, sureties, and witnesses are prepared and kept in an online database. This database can be linked to law enforcement agencies to ensure fast and accurate information availability to the court. A person has to scan a biometric reader to identify themselves and their entire history can be instantly retrieved. As technologies evolve, so do crime patterns and perpetrators intent on fooling a judicial system. If there is one thing that does not change over time and remains unique, that is our biometric attributes. So there is a pretty good chance that, having the capability of using biometric identification in judicial systems can increase efficiency and effectiveness and minimize the number of criminal incidents. About the Author: Mohammad Shahnewaz leads the digital marketing team at M2SYS Technology and is an occasional blogger. He is passionate about writing various government and enterprise biometric identity management technology adoption related topics and the changes it brings on people’s lives.